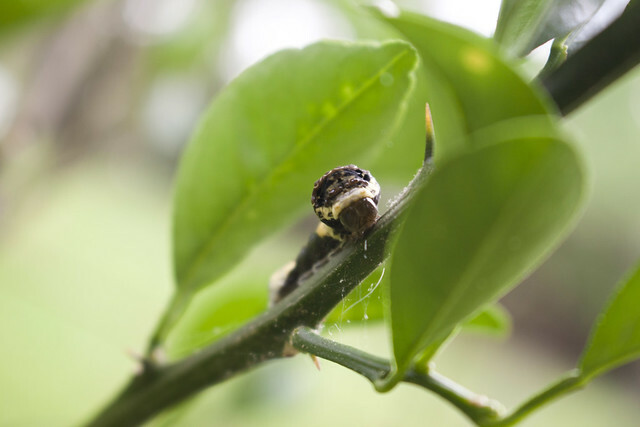 The last time we noticed, or at least I noticed, giant swallowtail caterpillars on the citrus trees was back in October 2014 not long after Forest was born. 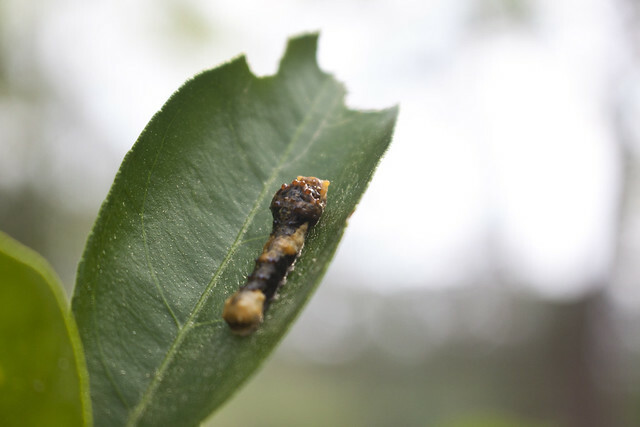 I’m sure there have been more caterpillars in the years since; however, we recently found ourselves hosting some very fat and hungry caterpillars. 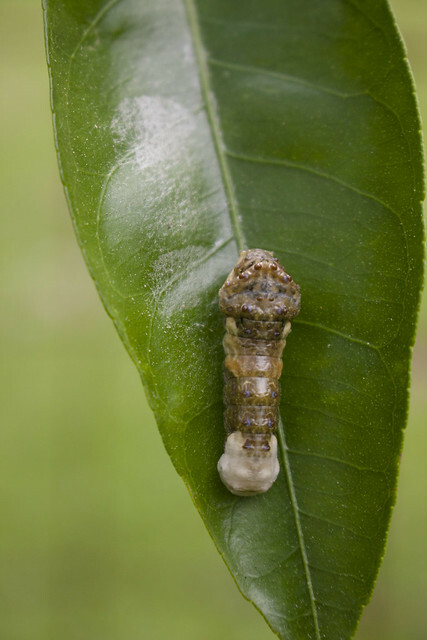 In the first instar they looked so tiny and like they wouldn’t terrorize the citrus too much but as they’ve grown into other instars they’ve shown themselves to be the ravenous babies that they are, munching away on our poor citrus. 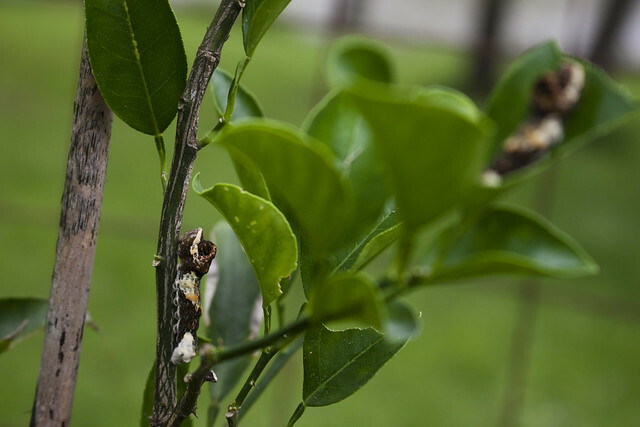 The citrus that was badly set back from the freeze in January. Our lemon tree took the worst hit—devastating, too, because it was the largest of the trees—and Chris trimmed back the dead limbs only to have the remaining central limb destroyed by some surreptitous animal despite being fenced in. The tree is still alive but trying to come back from a 3′ stump. 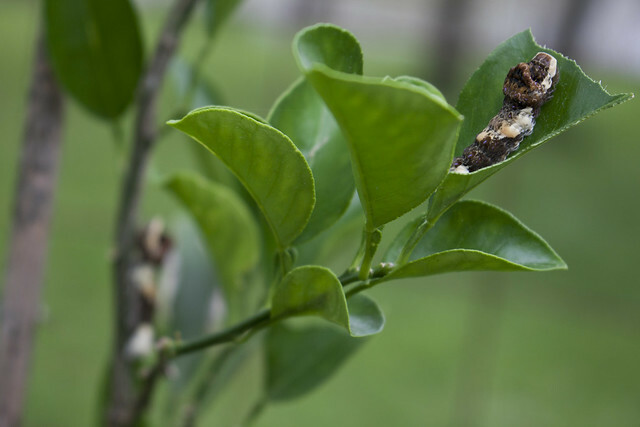 I threw out an idea that we should get a sacrificial lemon tree, a larger and healthier tree, to plant and move the caterpillars so our citrus could recover. It was only after Chris bought the tree home and told me he had gotten it from Lowe’s that big flashing warning signs lit up in my brain. A friend on social media had recently been complaining about the complicated/secretive tags on plants at Lowe’s regarding bees and regarding the status of the plants being sprayed with pesticides. I’m only saying Lowe’s here because that’s where we were both shopping, but you can just transplant this scenario to other big box stores. This friend was shopping and was looking at the tags which said something to the effect of keep away from wildlife and to not ingest. I guess this was changed from previous tags which stated more effectively that they had been sprayed. She asked the vendor putting the plants out if they had been sprayed with pesticides and that was confirmed. I checked some of our plants that had been bought at Lowe’s, just some general annuals Chris had picked up, and sure enough the cryptic tag label was there. I wasn’t terribly upset because we don’t have a ton of them at the moment but it made me think a little bit about buying plants there anymore, particularly because we will be getting bees again soon. Anyway, Chris brought the new lemon tree home and said it was from Lowe’s which made me stop and wonder if the trees were sprayed. Sure enough we found a tag on the tree that it had been treated with neonicotinoids by the grower in early March prior to it being shipped to the store. 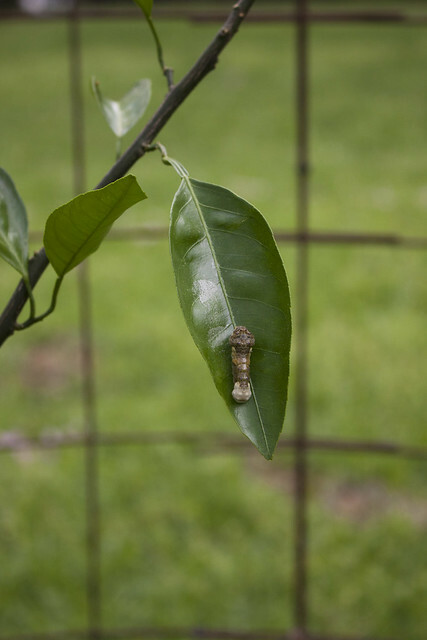 We opted not to intentionally risk all of the caterpillars and only moved two as a test run, to see if the spray was still affecting the tree. Upon my research I found that there were two options for the chemical treatment, drenching of the root system in which the chemical is taken up throughout the plants system, and general spraying. The spraying had a better chance of it dissipating faster but the drench could stay in the system quite awhile, months or longer. Well. 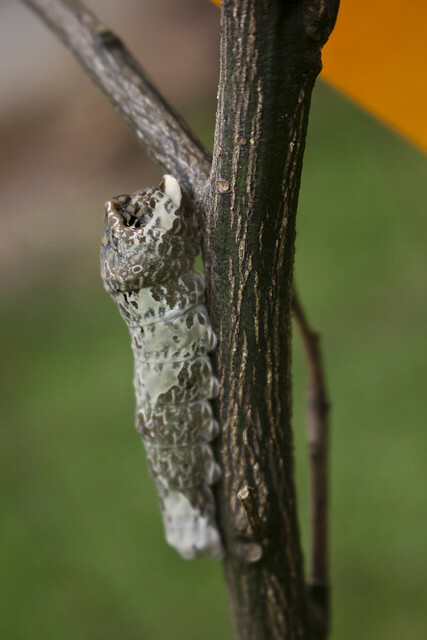 The tree was definitely treated because both caterpillars didn’t last a day. And we have *not* transferred any more over. I feel really bad that we sacrificed those two but I’m glad we now know better. It also made me wonder if other citrus (or trees and plants in general) are sprayed at other nurseries, the more local and organic places. 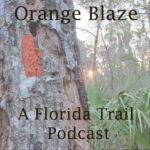 Honestly I imagine the citrus to be treated no matter what because of all of the citrus issues and how badly ag offices in various states want to prevent crop damage from spreading. As for other potted plants, I have no idea. But I will be asking more questions now. I saw my first monarch the other day while I was mowing and I’m now on monarch caterpillar watch, checking the milkweed every few days for eggs or small chompers. I’ve been finding all sorts of other caterpillars and need to start a notebook of the ones I see in the yard so I can be better at identifying them. Ohhhhhhh!! Showing Tom right now. You should see if there’s anyone local who breeds butterflies for weddings, botanical gardens, releases, etc. because they almost ALWAYS have extra plants to sell that have not been treated. The plants don’t look great (usually overgrown in giant plastic buckets and their vines tangled in a home-made trellis) but they are perfect as sacrificial plants and you don’t have to stress over their history. 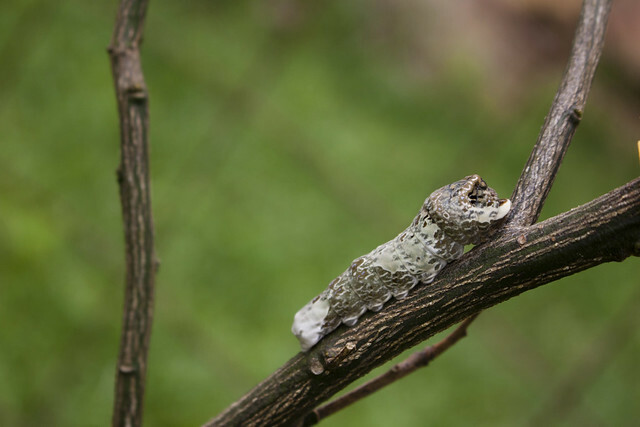 I don’t know if that’s feasible for you guys, but we found a local butterfly guy and Tom runs up to his farm once a month for a bunch of plants and whatever caterpillars he might have on hand.